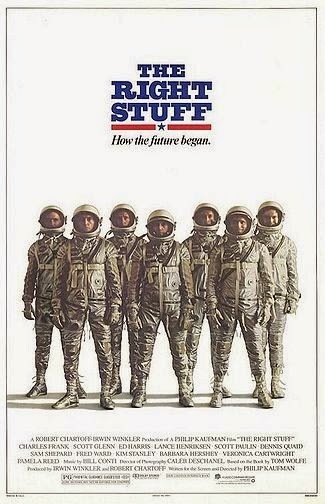 Tag line: "How the future began"
I always loved the opening scene of Philip Kaufman’s 1983 award-winning film, The Right Stuff, during which a narrator, talking as images of black and white clouds rush by, says, quite cryptically, “There was a demon that lived in the air”. The “demon” he’s referring to is the sound barrier, which “lived at Mach 1 on the meter, 750 miles an hour, where the air could no longer move out of the way”. At that point, the movie takes us back in time to 1947, relating the events that led Air Force Captain Chuck Yeager (Sam Shepard), stationed in the middle of the California desert, to try and break the sound barrier. From these beginnings, The Right Stuff winds its way towards the Mercury program of the late ‘50s and early ‘60s, which marked the start of America’s fascination with outer space. Historically speaking, there’s enough material in either of these stories (Yeager’s flight and the Mercury astronauts) to fill half a dozen movies. But The Right Stuff is not a history lesson; it’s a tale of courage, of the determination that pushed a select few to reach heights most only dreamed of. It’s a film about…. well, the “right stuff”, and how the men who possessed this unique quality carried the U.S. to the stars and beyond. In the days that followed Chuck Yeager’s momentous flight, dozens of hot-shot pilots, hoping to break his record, descended on the same small patch of California desert. Some actually managed to go faster, though in most cases, their glory was short-lived (whenever someone outdid him, Yeager simply hopped in another plane and promptly reclaimed the title of “the fastest man alive”). Among the upstart pilots looking to make a name for themselves was Virgil “Gus” Grissom (Fred Ward), Donald “Deke” Slayton (Scott Paulin), and Gordon “Gordo” Cooper (Dennis Quaid), and while none of the three ever bested Yeager, they were in a prime position to take part in a new venture: America’s space program. Hoping to beat the Russians in the “Space Race”, the newly-created National Aeronautics and Space Administration (aka NASA) launched an extensive search for the seven best pilots in America (Yeager himself was never considered because he wasn’t a college graduate). Gus, Deke, and Gordo all made the cut, as did the Navy’s Alan Shepherd (Scott Glenn), Wally Schirra (Lance Henriksen) and Scott Carpenter (Charles Frank). Rounding out the seven was the pride of the United States Marine Corps, John Glenn (Ed Harris), whose enthusiasm for the project would make him the group’s unofficial leader. Over the years, these men, known as the Mercury astronauts, would capture the imaginations of millions of Americans, and battle it out with administrators, engineers, and politicians to ensure they remained an integral part of the process. The various scenes where history is made, from Yeager’s record-breaking flight to John Glenn’s 1962 orbit of the earth, are as exciting as they come, and it’s in these sequences that the movie establishes itself as a rousing adventure. But even in its quieter moments, The Right Stuff stirs us like few film have before. Whether its Chuck Yeager staring at the moon and realizing that, no matter how good a pilot he is, he’ll never fly as high as the astronauts; or John Glenn talking with his wife (Mary Jo Deschanel), telling her how proud he is to be part of the Mercury program, The Right Stuff gives weight to each and every moment on-screen. Occasionally, Kaufman even shines the spotlight on the wives, including Glennis Yeager (Barbara Hershey), Trudy Cooper (Pamela Reed), and Betty Grissom (Veronica Cartwright), who watched as the men they loved risked their lives day in and day out, never knowing if the next time their husbands walked out the door would be the last. If their men had “the right stuff”, so did these ladies, and the movie goes to great lengths to show us their sacrifices as well. Even for a 3+ hour picture, this is a lot of territory to cover, and it’s to the filmmakers’ credit that The Right Stuff does justice to every aspect of its monumental story. Featuring thrills, humor (Harry Shearer and Jeff Goldblum play a couple of bumbling NASA recruiters tasked with finding the “best of the best”, and Donald Moffat is hilariously over-the-top as the egotistical Lyndon Johnson) and a little heartbreak, The Right Stuff is as grand as any Hollywood epic, and, in my opinion, is one of the finest motion pictures of the last 50 years.